One of a set of black and white photographs based on my colour originals and enhanced / converted into mono by Kevin Green (you can contact him at www.freelancebloke.co.uk). 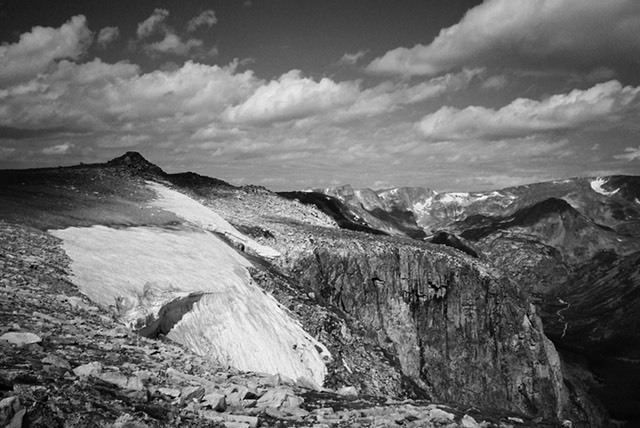 This one is a black and white photograph of the Beartooth Mountains, viewed from the Beartooth Highway, Montana (heading towards Yellowstone), one of America's most scenic drives. Other photos in this set include Aguereberry Point, Death Valley; Courthouse Towers, Arches National Park, Utah; Guadalupe Mountains, West Texas; Interdune Flats at White Sands National Monument; localized storm over the desert in New Mexico; Mesquite Flat Sand Dunes, Death Valley; Mount Rushmore, South Dakota; Ripple in the sand at dawn, White Sands; two people walking across Bonneville Salt Flats, Utah.